That doesn't mean we slam the door when a new one arrives, particularly if it has a certain classy slickness to it, and more than a few tweaks to its oeuvre. 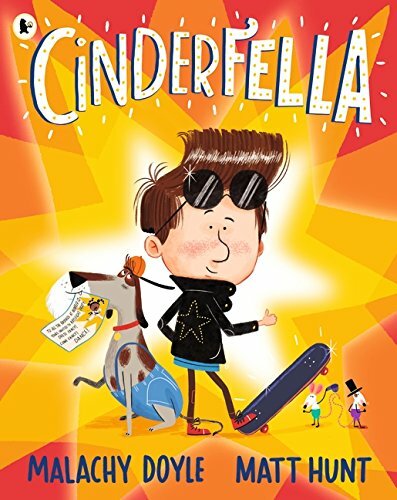 "Cinderfella" by Malachy Doyle and Matt Hunt does a bit of gender-swapping, which is probably the first thing you'll notice (even gender-swapping the dog, who you'd swear was male from the illustrations). So instead of the tale of a put-upon young girl treated shoddily by her step-sisters you've got two over-bearing older brothers here, who treat their little sibling like an unpaid slave. Gus and Gareth are a right pair, barking orders at poor Cinderfella left right and centre. “Turn up the TV! Shine our scooters!" the brothers cry. "Finish our homework!” They're mean, vain and slovenly. But on the day of our story, Kayleigh, the town's kick-fastic karate champion, is having a party, and Cinderfella is determined to dream big, dress fancy and DANCE. Unfortunately his brothers have other ideas - so while they don their best party outfits and scoot off to the party, they leave poor Cinderfella behind. It's a good job his fairy dogmother Ruff is on the case, and notices that the invite says that everyone in the house is invited. So it's time for a transformation, and with a cool quiff and a borrowed pair of sunglasses, a sparkly skateboard and a killer leather jacket Cinderfella is ready to strut his funky stuff and win Kayleigh over. C's best bit: Ruff is the star of the book as far as she's concerned. Wise and craggy, but uber-cool. Daddy's favourite bit: A few neat tricks up its sleeve but fizzles out a bit towards the end. Great idea though and some truly awesome artwork from Matt Hunt in this. "Cinderfella" by Malachy Doyle and Matt Hunt is out on 9th August 2018, published by Walker Books (kindly supplied for review).